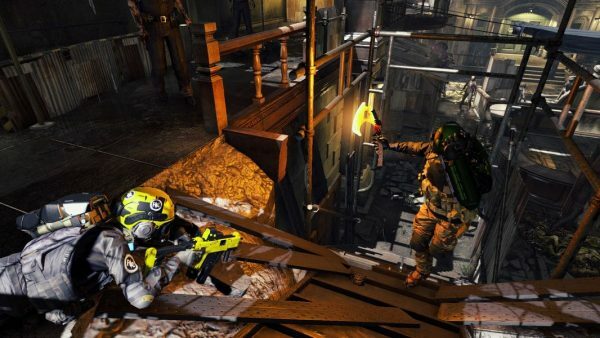 Umbrella Corps is the latest multiplayer entry to the long running Resident Evil horror franchise. Players are put in the combat boots of a highly trained mercenary in intense three on three matches. Teams will not only have to fight one another, but also fend off masses of Resident Evil’s unforgettable monsters in Umbrella Corps. 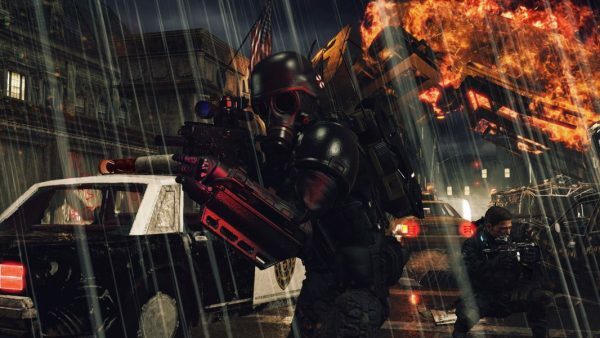 Umbrella Corps is set a few years after the events of Resident Evil 6. After the fall of the Umbrella Corporation, mercenaries are now swarming old sites in hopes of scoring valuable data Umbrella left behind. Players take on the role of one of the mercenaries sent in to scavenge the loot. These guys are survivors of extensive testing and are armed to the teeth with the latest weapons and gadgetry. As a multiplayer focused game, there is understandably very little story to the game. What is there is told in short little intro paragraphs in the single player Experiment mode. It is pretty bland and uninspiring stuff are barely passes as window dressing for the game. The writing itself is pretty poor and more in the vein of a B-movie horror with its poor one liners. 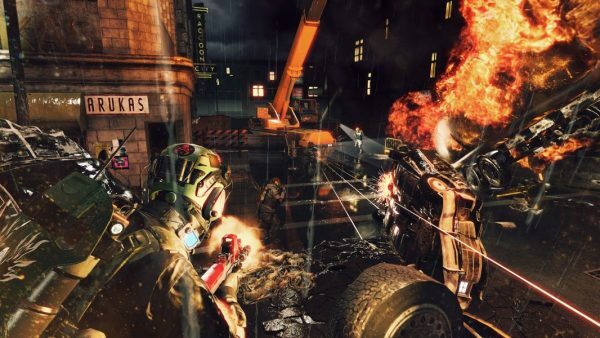 Umbrella Corps is a mix of third and first person shooting. 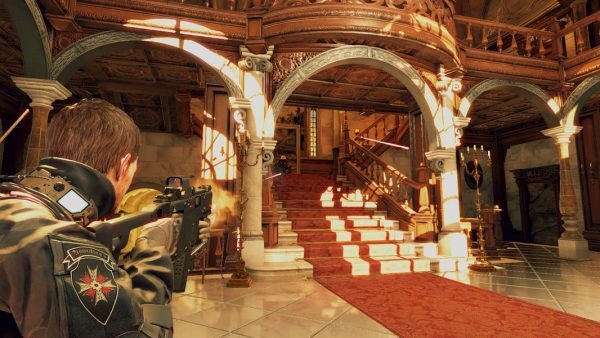 Most of the game is played in Resident Evil’s tight, over the shoulder action camera. When the player aims down the sights, the camera switches to the traditional FPS style camera. 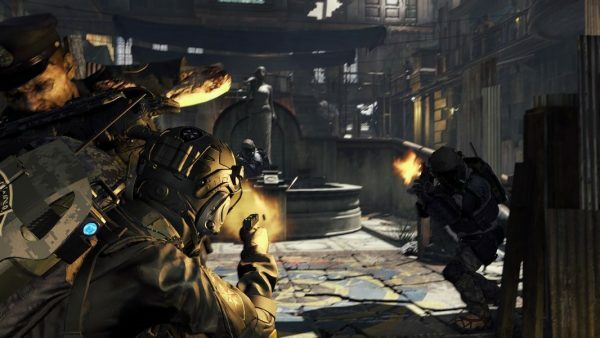 Besides a short tutorial on basic shooter controls and one controls specific to Umbrella Corps, gamers can play Umbrella Corps’s single player Experiment mode and the game’s main draw, multiplayer. Multiplayer pits two teams of three against each other in a best of five battle, with rules changing each round. For those who need a little time in the wading pool, Experiment mode is essentially an extended tutorial using the multiplayer rule sets. Each player is armed with the standard modern FPS loadout: primary, secondary, and melee weapons along with grenades. 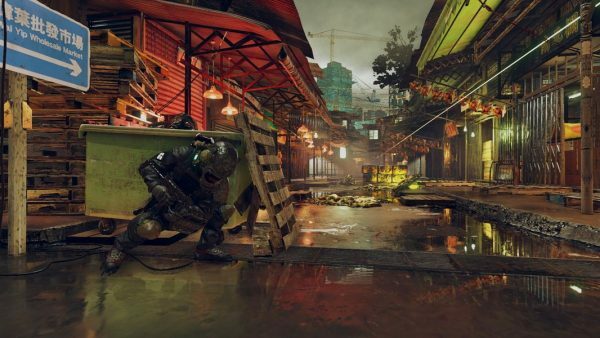 As players gain experience in ranked matches, a small handful of weapons beyond the starting K-12 AX SMG, Doberman Pincer shotgun, Blackjack pistol, and Cronus melee weapon are unlocked. There isn’t much variety in the primary unlocks, as they are all submachine guns and shotguns. In true Resident Evil fashion, ammunition is relatively scarce, so players simply can’t fire magazine after magazine of rounds willy nilly. Umbrella Corps is an awful shooter. For starters, the controls are an absolute mess on the PC. While the controller layout is passable and familiar to Resident Evil players, the keyboard and mouse bindings feel like the controller input has been directly rebound. The mouse movement is possibly one of the worst experiences I have had in my gaming career. There are only nine sensitivity settings with each setting providing a substantial change in sensitivity, meaning a lot of the fine tuning will have to be handled by the mouse firmware. Even after finding a passable setting, it feels like some serious mouse acceleration and input lag issues are ruining the show. To make matters worse, Umbrella Corps is plagued with an Xbox One controller issue right out of the box, requiring some driver tweaking to get the game to stop registering an infinite press of the right D-pad. Beyond the poor controls, the game design itself is simply flawed. In theory, Umbrella Corps sounds like it has everything for a great competitive shooter: short, intense match ups with an extra unknown factor in the form of zombies running around. In practice, Umbrella Corps feels like a bloated, overloaded mess. One of the biggest problems is the small levels. Although the game is limited to two teams of three, the number of NPC zombies that spawn in the game make it feel like players are duking it out in a phone booth. While players spawn with a zombie jammer on their back to render them invisible to the undead, firing a weapon or getting shot in the jammer will immediately alert the zombies to the player’s presence. Short of holing oneself on top of a roof, the zombies make it pretty much impossible to have a firefight last any longer than a few seconds. The available rule sets in Umbrella Corps are the traditional mainstays for the most part. For the most part, they work for the small maps and team sizes for the exception of VIP mode. The small team size just doesn’t work as the chances of becoming the next VIP in an inopportune time skyrockets in comparison to a more traditional six on six match up. There are some truly awful objective locations in the game, with some sitting in a middle of a wide open space, then others plopped in a next to impossible spot to attack. While weapons are the standard spread of modern special operations firearms, the guns generally feel like the same gun with some variation in firing modes. Shotguns are traditionally a real pain to get right in a competitive shooter, as the zone where shotguns have enough power and range to be effective without being overpowered is an incredibly small spot. Umbrella Corps isn’t the first and definitely won’t be the last to completely miss the mark as shotguns are completely underwhelming at even a spitting distance away. The melee system is probably the only bright spot when it comes to Umbrella Corps, and it’s a pretty dim one. There is a pretty decent counter system for melee attacks, allowing players a fighting chance; however, the game fails to inform players of its very existence. Until a player learns how to counter effectively, they are doomed to deal with an unbeatable rush tactic that involves an axe swinging player charging their target down while soaking an absurd amount of bullets without flinching. It’s not fun, at all. While I understand the normal camera angle is the same used in modern Resident Evil games when aiming, it does not lend itself well for a competitive multiplayer game. The character takes up a good portion of the screen, making it difficult to maintain situational awareness. Either sticking to a first person view all the time or allowing players to move normally in the traditional zoomed out third person angle used in Resident Evil 6 would have been a wild improvement instead of this lousy and awkward angle. 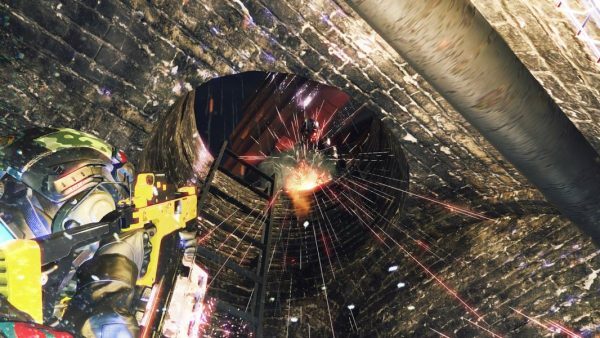 Umbrella Corps also suffers some quality of life problems in multiplayer. The game gives players a huge number of weapon preset slots, but no way to rename them. The team balancing is pretty awful. The game is more than happy to dump a bunch of low level players on one team, then stack the other with veterans. Sure levels don’t have a direct correlation to actual skill, but putting together one team of level ones and a second team of players rocking levels above 20 is just asking for a miserable experience for one side. As if PC gamers needed to be reminded that Umbrella Corps is an awful port job, there is also no push to talk button. Umbrella Corps does have a single player mode, but it feels more like a completed checkbox than an actual mode. The Experiment mode puts players through several rounds of player vs zombie using some of the multiplayer rulesets. In exchange, players get a few unlockables and some really uninspiring story. 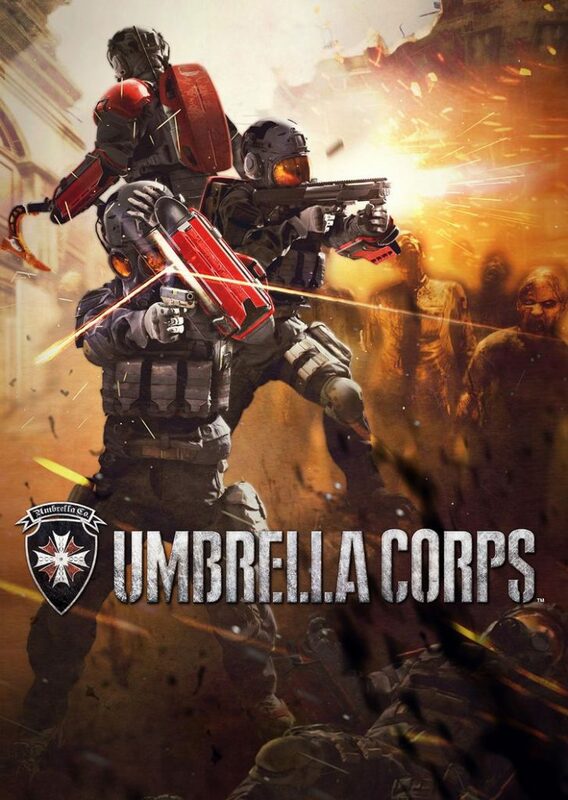 While Umbrella Corps sounds like the sort of game that would have been great for a co-op mode, I’m rather glad Capcom didn’t even bother considering the lackluster single player mode. Experiment mode is essentially an extended tutorial that has not only overstayed its welcome, it is now sleeping in your bed and eating your breakfast in the morning. Umbrella Corps is a screenshot darling. When everything is standing still, the game looks pretty nice. Too bad the animations range between passable to absolutely garbage. The zombie animations are good enough, though prone zombies have serious clipping issues with walls. The player animations on the other hand are absolutely awful, especially the player’s own character. The walking animation looks terrible and none of the movement animations are matched to the movement speed. The result is the player looking like they are skating through the world. 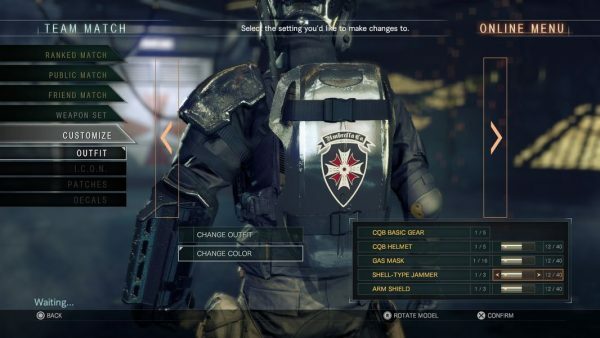 Player customization is one of the brighter spots in Umbrella Corps. There are a variety of uniform and gear loadouts to choose from as players unlock them in ranked mode. My favourite part is the variety of unit and morale patches that can be attached to the helmet and the upper arm pocket. The art team actually made an effort to create real looking patches, down to the right colour schemes and embroidered look. The audio leaves a bit to be desired. Sound effects are ok, though the guns sound a little too subdued. The voice acting on the other hand is pretty poor. For a bunch of highly trained PMCs, they don’t actually communicate with each other. The player character just quips one liners to themselves. The voice acting for the commander on the radio is also pretty iffy. The soundtrack is decent, though the lobby music has the most annoying high pitched whine that drags on until the sound of a plane takeoff is heard. Umbrella Corps is a flat out disappointment. On paper, the game sounds like a great idea, but the execution is awful. I have to wonder where did everything go so wrong? It is clear that the game was ported by a team who has no idea what is expected in a good PC release. The gameplay feels clumsy and the zombies just make everything worse. The animations are pretty embarrassing to the Resident Evil franchise and the controls are just awful. There’s a good reason why the game is practically dead on Steam less than a week into release, Umbrella Corps is not fun. Umbrella Corps is a massive disappointment and a stain on the Resident Evil franchise that should be avoided.